Than pretend I feel alright"
Now I'm ready to start"
Than live in the shadows of your song"
My personal story behind this choice: I LOVE Arcade Fire. You might know them better as 'that band at last year's Grammy Awards who seemingly came out of nowhere, surprised everyone, and won Album of the Year'. Well, I was one of the people jumping up and down in my living room, yelling excitedly at my TV. The same friend who introduced me to last week's feature, Pilot Speed, introduced me to Arcade Fire about 6 or 7 years ago. Not too long after I became familiar with their music, I got to see them open for U2 in Ottawa in November 2005. They were freaking amazing. I really, really hope to have the chance to see them live again someday. Their album entitled Funeral remains my favorite because it was the first one I was introduced to, and I listened to it endlessly, especially before and after I saw them live. And even though I have a few favorites from that album, I chose Ready to Start from their newest album The Suburbs because it's one of my current obsession songs that once I play it, I have to play it over and over. Side note: I heard somewhere years ago that playing a song over and over is a sign of insanity. I must be certifiable then, because I've done that my entire life lol. Anyway, I hope you love this song as much as I do! Check out the Arcade Fire website to learn more about the band. Reason is on our side, love"
*Jumps up and down in my seat* OMG adore Arcade Fire..did you see them blow everyone away at the Grammys? They won Album of the year and tore up the stage performing at the end. Everyone was tweeting..Who are they that they won..and I was like phhftt..you people dont know good music if you dont know them! Loved your choice this week! 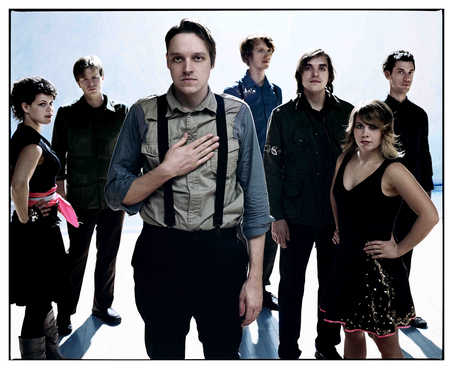 Rebellion (lies) is probably my favorite Arcade Fire song :-) very awesome band! and you picked a great U2 lyric for today. It's from one of my fave albums! I love Arcade Fire! I didn't know they played at the Grammys!!!! Lame that I missed them. :( I guess that's what I get for not having tv. lol Thanks for sharing the awesomeness that is Arcade Fire!! !